The Fencing Club is held on Wednesday afternoons from 3.25pm to 5.00pm in the gym. Boys from any year group are welcome to attend. The club is coached by Katie Arup who is a past Olympian from the British Olympic Fencing Team. The RBAI fencers train hard each week, learning technique with one-to-one lessons, practising group footwork and sparring with their friends on the electric scoring equipment. Each year, we have a fencing trip to London where the Fencers from Year 9 and above get the opportunity to represent the school at the Public Schools Fencing Individual Championships at the Crystal Palace National Sports Centre in London. And in May we travel to Kildare to fence in the Irish Inter-Schools Team Championships. Many RBAI fencers go on to compete in NI National age group competitions each year with several taking the sport further still by representing their country and competing Internationally. 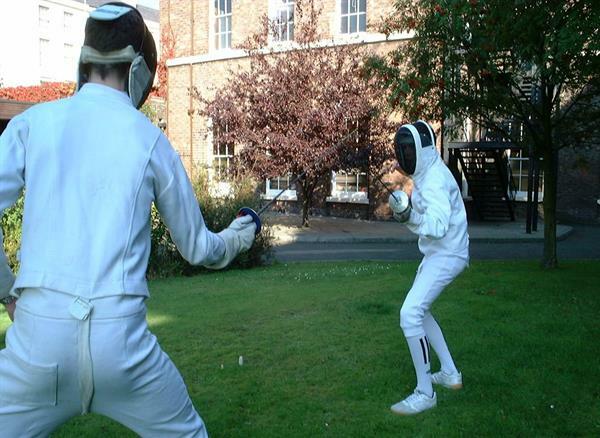 This year, Rowan Luney (Year 13) is the RBAI Fencing Captain. He has been competing for the Irish National squad on the International circuit and representing the school in London at the annual Public Schools Fencing Championships. Fencing has given Rowan the opportunity to travel and compete across Europe at Cadet and Junior level in France, Slovakia, Hungary, Poland, Germany and England. In the 2017/2018 season, Matthew McKay (then Year 12) qualified to represent Ireland at the World Cadet Fencing Championships in Verona, Italy. Both Rowan & Matthew were selected for the Junior NI Commonwealth Team. Great achievements for them both.